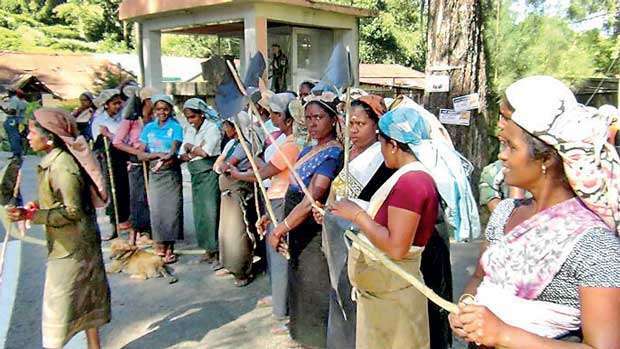 The agitations and strikes by tea estate workers highlight another aspect of the plight of Sri Lankan Tamils. Tamil tea estate workers, here the Sinhalese labourers form the minority, claim that they have been exploited for generations in the tea industry which is over 150 years old. The simple lifestyles that the estate workers prefer to maintain has been exploited by their paymasters who seem to keep the workers’ lives stagnated. The present agitation by the workers is to obtain a basic daily wage of Rs 1000, but in reality what they earn, sans allowances, is a lot less than that. By Friday (January 25) all the discussions on behalf of the workers could promise them a daily wage of Rs 700 plus a price share supplier of Rs 50; which would make their daily wage Rs 750. 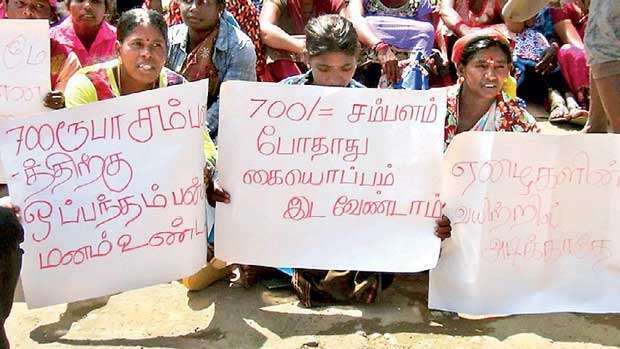 State Minister of Plantations Industries and Secretary Lanka Jathika Estate Workers’ Union (LJEWU) Vadivel Suresh has said that he’d back the workers to receive a 150 rupee rise in their daily wage. The Estate Workers Union (EWU) and the Estate Employers’ Federation (EEF) entered into an agreement to pay the workers a basic daily wage of Rs 700, but the workers maintain that they can’t agree to this. Now the question arises whether the requirement of the workers, which is voiced through the EWU, has been effectively communicated to the authorities? The workers in Hatton and Bogawanthalawa areas managed to pinch their paymasters by carrying out agitation campaigns on January 27 (Sunday) which resulted in the transport on the main road in the area being affected. The tea estate issue perhaps highlights one of the most suppressed groups of the working class in Sri Lanka. Here the paymasters call the shots because the workers are in a position of being trapped in the estate sector. One of the key benefits enjoyed by the workers is the free housing provided by the management. Those who contemplate on escaping from engaging in this low paying job are faced with the reality of finding housing facilities when they find better employment in urban areas. Some of the Tamil estate workers are also burdened with having to repay loans obtained from banks. When the EPF and ETF contributions are deducted from their earnings these workers are only left with sorry stories to relate. 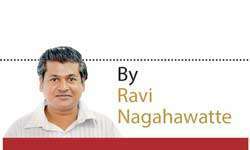 The news that Minister of Plantation Industries Navin Dissanayake has given instructions to grant Rs 100 million from the Sri Lanka Tea Board’s kitty to pay ‘back wages’ for three months will sure bring some warmth to these ‘poor’ workers who are shivering in the cool climes. But this good news would amount to nothing if the workers fail to force the EWU, which represents them, to push the EEF to pay them a daily basic wage of Rs 1000, without this figure being supplemented with allowances. For their disadvantage National Union of Workers Leader and parliamentarian P.Digambaram hasn’t backed their cause. Digambaram, according to newspaper reports, has backed the stance taken by the employers in not to agree to the Rs 1000 day wage claim stating that the profits of plantation companies has declined. Given that this is a year for elections, the tea estate workers’ issue is sure to be taken seriously by the lawmakers. State minister Suresh gave a hint on these lines a couple of days ago when stating that they would postpone signing the agreement papers if any ‘party’ can come forward and offer a better package to the workers. From the perspective of the paymasters, the returns for the year 2018 were pretty low given that there were unstable weather, issues relating to agro chemicals and the stoppage of tea plucking. The result was a low output of 303 million kgs in production last year in comparison to 307 million kgs plucked in 2017. For the record, production between 2010 and 2015 ranged between 328-340 million kgs per annum. The paymasters also blame the workers for indulging in wasteful spending habits and not being responsible financially. They maintain that tea estate workers can do well with their hard earned money if they are wise with their spending. These paymasters also harp on the fact that the intense competition between tea manufacturing countries like China, India and Kenya has made Sri Lanka lose on export earnings. However the tea estate workers claim that the company owners are trying to transfer the burden of these losses to the worker. Employers state that the increase in wages that the workers demand can be compensated if production increases. Another angle to the story is the positive outlook retained by some estate labourers with regard to continuing with work on the fields. Such workers are of the opinion that estates should be protected because they offer them with a livelihood. They also agree that estates should not run at a loss. This seems a right time for workers to push for their claims. Their demands are also in a way tied to an election cycle. In this backdrop Ceylon Workers’ Congress Leader MP Arumugam Thondaman has promised to make a request from President Sirisena to increase the daily wage of estate workers to Rs 1000. He has maintained that trade union action would continue until plantation companies give into their demands. The tea industry brings Sri Lanka the second highest income in terms of foreign exchange. Apart from that as many as 900,000 people (4.5% of the island’s population) are employed and live on tea estates. Given the scenario it seems the tea estate labourers could see the sun shine on them this time around!